Read on to learn about some of the most iconic fences in the film and TV industry. In the first instalment of this 2012 hit film, Katniss Everdeen is seen crawling through an old electrical fence that surrounds the perimeter of District 12. This fence was built to prevent the district’s residents from escaping into the nearby area called the Meadow. The Perimeter Fence also keeps wild animals out of the district itself. In the book, the fence is described as a tall, chain-link fence topped with barbed wire. The fence also runs an electric current through the links as an added security precaution. But because District 12 doesn’t have great electricity resources—despite its coal production—the fence rarely emits an electric current. It’s also rusty and worn down from lack of maintenance and care. In the film, though, the fence looks like old, rusted spokes sticking out of the ground, connected with thin strings of electrical wire that helps to create an enclosed and eerie setting for the story. This Neil Gaiman novel-turned-film displays a magical barrier that enthrals readers and viewers alike. The Wall is made from stone, and rumour has it that it contains a secret. In the town of Wall (named for the wall that lies at the edge of the village), many people know to stay away from this barrier. The Wall is guarded night and day to prevent passers-by from crossing through a gap in the stone. Through trickery, the main character, Tristan, jumps around the guard and crosses through the gap into the magical land of Stormhold. During his time in Stormhold, Tristan discovers a fallen star named Yvaine, becomes a guest on Captain Shakespeare’s flying ship and evades dangerous witches and conniving princes. But to get back home to Wall, he must find The Wall and cross through the crumbled-stone gap. Another novel-turned-film, ‘The Maze Runner’ depicts a small clearing dubbed ‘The Glade’ inhabited by young boys. Surrounding The Glade are four incredibly wide grey stone walls that stretch between 200 and 300 feet (about 61 to 91 metres) high. In the film, these walls open up different sections of The Maze that some of the boys, called ‘runners’, explore in search of an escape route. During their trips, these ‘runners’ also try to find ways to stop the Grievers, dark-dwelling maze creatures that kill anything in sight. Thomas, the protagonist of the book and film series, ventures into The Maze and discovers a code that allows him and the other boys in The Glade to escape from captivity. During the zombie apocalypse, nothing protects surviving humans better than structurally sound fences. In this American horror drama series, Rick Grimes and his troupe of fellow survivors travel across rural Georgia to evade attack from a plague of zombies. At first, the gang settles in an abandoned prison surrounded by two secure, chain-link fences that are also topped with rolls of barbed wire. The fence protects them from the Walkers (their term for zombies) until one of their enemies attacks the prison and tears down the fence. In a later season, Rick’s group is led to a community called Alexandria. This town is filled with other survivors, thanks to tall, sturdy walls that protect the community. The towns’s founders used construction materials like wood and metal poles and metal panelling to construct the walls. One area also includes a covered sliding gate that allows residents to cross in and out of the boundaries. Additionally, these walls are braced from the outside, a feature that makes the fence incredibly structurally sound. This bracing keeps the fence strong against hordes of zombies that congregate around it, and it affords the residents of Alexandria more room inside. When the passengers of Oceanic Flight 815 crash-land on a mysterious island, they’re met with an array of unknown dangers. The island reveals many things to the crash survivors, including hidden caves with fresh water, buried hatches full of non-perishable food, a stranded plane and an ominous black smoke monster. One of the many surprises the survivors find includes the Barracks (or a small village full of houses) surrounded by an invisible fence. The Sonic Barrier, which is what the Others (or the residents of the Barracks) call this structure, is made of tall technological pillars that emit sonic waves in between each other. These sonic waves prevent animals and strangers from crossing the barrier and entering the Barracks. Eventually, some of the survivors devise a plan to cross through the fence to access a secure living facility. Want to create a fence as iconic as the ones mentioned above? 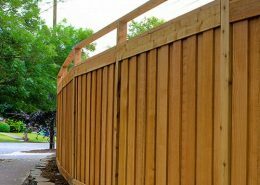 Work with the professionals at Amazing Fencing. 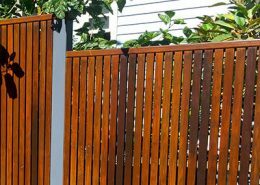 As one of the largest fencing companies in Australia, we can easily make your dream fence a reality. While we can’t build sonar fences, we can help you build anything made from timber, colorbond steel, chain wire and similar materials. Get your free steel fencing quote with Australia’s number one steel fencing installer.